We just finished our valentines last night and after seeing these cute thumbprint valentines I wish we had procrastinated one more day. These cute valentines would have been perfect for my preschooler and Lou would have loved being able to draw the details to the thumbprints. 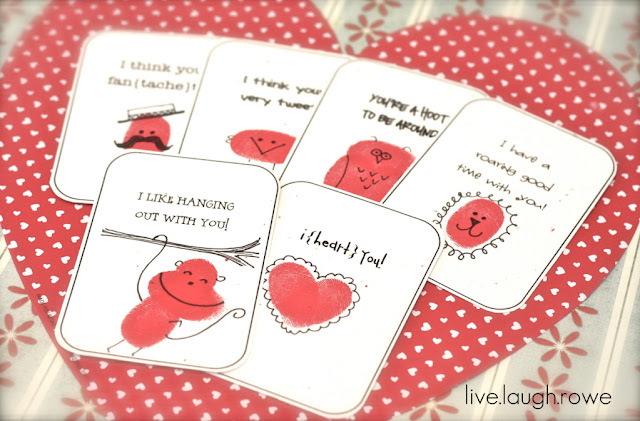 If you are still looking for a last minute idea, Live Laugh Rowe has free printable cards to make your own thumbprint valentines. Just add the thumbprints! These bring back so many memories. My mom is an artist and she would travel in the summer to do outdoor shows. Most of the time the whole family would travel too so we could help her set up and knock down. Well us kids would go run around, but my dad got bored, so he decided to offer thumbprint drawings in order to make some money. Some shows he made more than my mom. He was always slammed. Thumbprint drawings are personal and so cute. Love your Valentine's cards.